I’ve been speaking about demographics lately, and how I think I might be able to get rid of detailed demographic calculations (which pleases me). Yesterday in Imperial Scale to Manorial Scale in Mapping and Rulership I talked about the abstractions that may allow this to be so, including the rules for placing settlements of maximum supportable size. I decided to apply both and model a sample kingdom. I’m still planning a post showing the growth of a kingdom from a single small settlement (manor) up to a full kingdom, at least at a summarized level, but I thought I’d lay out what a sample kingdom might look like. I’m showing first the final map, such as it is, so you can see where this is going. I’ll step through the process as I did it. I feel compelled to mention that because this is only an example, I prepared and am presenting things a little unusually. 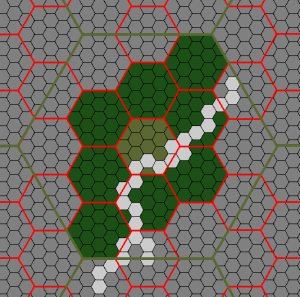 Normally I would start with an actual map, with terrain and ground cover identified, and possibly without the larger-scale hexes evident. In order to show the process in terms of what I have described before, though, it is necessary to include the artifacts of what I described. A kingdom is nominally an entire hex, with the smaller internal hexes representing duchies. I didn’t want the entire kingdom to be settled, so first I decided how many duchies the king was going to have. I rolled 9 on 2d8, which was convenient. I decided the king is himself a duke and gave him the most centrally located duchy, the khaki-colored one in the map to the left. You’ll notice a row of pale grey ‘earldom-sized’ hexes. I added a mountain range to the map for this exercise so I had an excuse to build a discontinuous set of earldoms, later. It is reasonable to expect that there are accessible passes through the mountains. Right now the kingdom consists of nine duchies, one of which belongs directly to the king and the rest to vassal dukes. Dead easy. Because the same rules are applied at each scale, it was now time to roll 2d8 nine more times, once for each duchy, to determine how many earldoms have been settled. I marked each duchy in a different color so I could tell them apart, and I placed the settled earldoms (marked in a paler color of the duchy) as shown in the image to the right. I notice that there is an earldom in the Duke Gold’s demesne right next to the mountains that is unsettled. That might be a problem for him later, but I’m not going to worry about that right now. At his level I only want to mark the largest cities. It is safe to expect that all earldoms will have at least one settlement of the largest allowable size (according to my notes yesterday, this would be a large town in each earldom, and some earldoms can have small cities if they have four adjacent earldoms with large towns, that are not already claimed by another earldom as support. No, I’m still not happy with that wording. In any case, in the image to the left I have not shown the large towns, since all earldoms have them. I have shown the small cities, large enough to be of interest to me here, marked with a ‘stripes fine’ fill pattern. Each small city is surrounded on four sides by earldoms with large towns, that are not claimed by other small cities for support. (I need to find a better way of expressing that.) The supporting earldoms with large towns are not necessarily located in the duchy as the small city being supported. There are duchies here eligible to have a large city, but only one will be able to qualify because there simply are not enough duchies with small cities to support two. I have to ignore Duke Dark Blue entirely because there are no small cities in his demesne. Dukes Brown, Burgundy, Purple, Green, and Red do not have enough neighboring duchies to support their having a large town. Only the King’s duchy, and Duke Gold and Duke Sea Blue have the required support. The king grabs it, of course. The small city closest to the mountains is upgraded to a large city. Up to now I’ve shown the duchies with the full hex colored, primarily for reference during discussion. Let’s turn that off. In the image to the right, the duchies are shown as they are settled, rather than as their abstract hex representation. The kingdom is far from fully settled, with earldoms all around, and even full duchies in four of the six corners (and the three ‘northern split’ duchies have no friendly settlement. Which isn’t to say that there is nothing there, just that it likely is ‘not civilized’. So, ‘turning off’ the fill for the duchies shows us a compact kingdom with lots of room to grow. The Khaki Duke (as opposed to the king) has a little room to grow if he moves into the mountains, unless he wants to impinge on his neighbors. As king, there is lots of room outside the other duchies. I took some liberties here, building a fairly contiguous kingdom in order to illustrate city placement. I think as a game it might work better to have them start a little more sparse and separated, then grow toward each other. This provides some built-in room to grow, natural ‘borderlands’ where perhaps the wild things are limited in their wildness, and can lead to contention as the rulers compete for unclaimed space. There is really nothing disallowing a ruler from stepping outside ‘his hex’, after all. 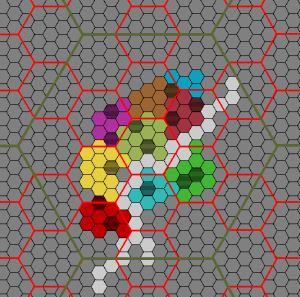 Having too many subordinate demesnes under direct control could become troublesome in the amount of effort needed to administer them (as a ruler; as a game I figure that unless something acts to change them — perhaps randomly — they basically don’t change… but random events are not uncommon). 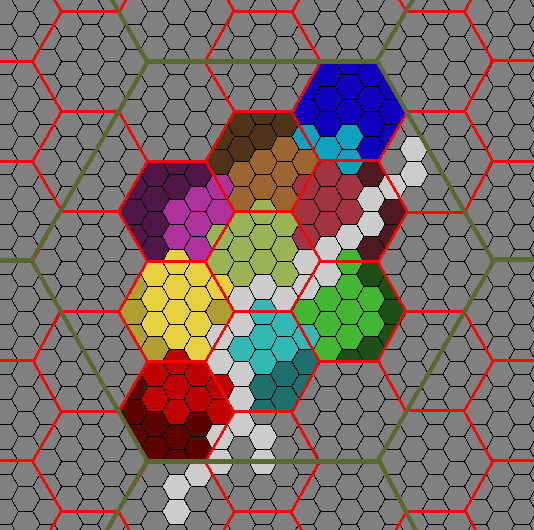 Alternatively, in a more cooperative scenario, allied rulers might start near the shared corner or edge of adjacent hexes and grow out from there, giving themselves earlier opportunity to enlarge their cities. In practice I think I would also start with a map illustrating more terrain. I placed some mountains to give a reason to spread the duchies out a bit, but really there should be hills, forests, swamps, and so on, all of which can have different effects on settlement. I’ll have to explore the effects of different terrain types later. Having different terrain types with different effects can, I think, lead also to different growth patterns. Here I focused mostly on defensive (minimal perimeter, at least) layout, but under other circumstances you might choose to settle the arable areas first, or the resource-rich areas, and avoid the swamps and wastelands until either you need the space (and resources), or to tame the area and keep the dangers away. Another time, though, for tonight I think I’ll knock off. Cities don’t really work like that. They grow at river mouths because the river gives them low-energy access to primary produce from a wide area, and the sea gives them the same to every other sea port. London’s not big because the king made it so, it’s big because the Thames is a huge, slow, deep, easily-navigable river running through rich farmland with a perfectly sheltered mouth and no shifting sand bars. The king then moved there because it’s naturally huge and rich. They’re also often independent of the county/duchy system, the Duke of York may nominally own tax rights over a huge swath of land around York city, but the city itself can be treated as an independent county ruled over by it’s own lord mayor. But anyways, fine, just count “surrounding duchies” only via rivers and stuff, or post-facto arrange navigation through your cities. Land-bound cities are usually where rivers meet (or nearly meet, exit lakes, or are no longer navigable) or smaller ones near where passes, isthmuses, bridges, crossroads, or canals concentrate land traffic. Roads and canals have to serve natural cities first, of course. Also, they tend to be on a hill, so they don’t flood too often. Just so you know. As I recall from my reading, in feudal times most major towns had a charter from a lord (and thus paid a tax to the lord) but were basically hands off beyond that. And the difference between different categories of towns depended on, I believe, whether or not a bishop had his base there. I’m finding it difficult to balance playability with reality and history. Re: Reality. Just use that small population means harsh land and large cities mean navigable rivers. It doesn’t matter if you’re generating land or towns, they’re the same deal. Towns get rivers and rivers get towns either way. Join the dots at the end, the biggest cities get the easiest trade routes. Your 2d8 for sub-districts can already handle that sparse populations use more land per person, because the population can take up the 16 sub-hexes either way. A Marquis who has 16 Barons can still have barons with only a couple manors each, and the rest of the land ends up forest, swamp, mountains, or whatever. If a mountain range later falls in the path of your river, you’ve got an impassable gorge. No problem. Anyhoo medieval reality is horrible and messy and often contradictory, and now it has magic and monsters too. The Baron’s borders IRL don’t line up with the Bishop’s, and neither border with those of the common-law courts. So no matter what your playable stuff produces, it may be the messier it is the better. Empty spaces on the map for “no reason found yet” are an adventure waiting to happen. Here there be Dragons (maybe). Pingback: A-Z April Challenge 2013 | Keith Davies — In My Campaign - Keith's thoughts on RPG design and play. Pingback: A-Z Challenge Forfeit | Keith Davies — In My Campaign - Keith's thoughts on RPG design and play.